Raw goodness in the UK?! Yes, indeed! And not just your typical, run-of-the-mill veggies – Sarah’s Holistic Health blog, raw food recipes, juice cleanses, and detox retreats, are just the beginning! Watch-out, Britain! 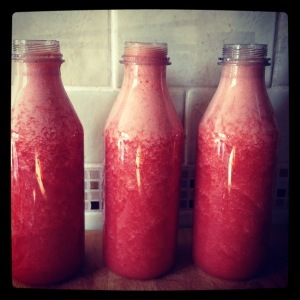 The Juice Lady is coming – and she’s got raw food cakes, fresh juice, and a whole lotta’ lovin’! And we wanted to be the first to tell you about it! That’s why we asked “the Juice Lady” herself (a.k.a. Sarah Hook), owner and creator of Juice Rehab, to stop by Chakra Center and fill us in on what she’s been up to over there in the United Kingdom. Sarah shares how raw food has changed her life, and how you can be apart of the goodness. Enjoy! And cheers to good health! How did you get interested in raw foods/health? At the age of 19 I suddenly experienced poor health. I was getting headaches each day, fatigue where I would wake up each morning feeling like I had a hangover, my skin was showing signs of rosacea and I was struggling with acne for a too. I thought I had a virus, as these symptoms came on very quickly, but after two months (and lots of doctor’s visits), I still felt the same. No diagnosis was made, and I was feeling very low and helpless. A colleague of my mum’s lent her a book on the anti-candida diet; they had experienced greater health from following it and my mum said I should give it a go. I read through it and realized I had all the symptoms of a candida overgrowth. All the antibiotics I had taken for my skin and the birth control pill I took to control my Endometriosis and skin problems had contributed to the cause. After two weeks of following the diet, (cutting out all sugar, including fruit, cutting out bread, wheat, dairy, all processed foods), I felt so much better. My daily headaches went away, and I could get up in the morning without having to literally drag myself out of bed. After a month of following the diet and adding probiotics and other supplements to help balance my healthy gut flora, my health got better and better. That was just the start, as I had experienced first-hand how much food affects our health! I followed a whole food diet for years, sometimes falling into bad habits but always coming back to it when old symptoms returned. I had managed to reverse all of my symptoms from Endometriosis, which made my cycle much more pleasurable and I didn’t need any medication for it anymore. What are some of the benefits you have seen in your own life from eating raw? At the age of 24 I found raw foods. I was still trying to clear my skin, as this was still temperamental depending on my food intake. I tried 100% raw diet for a week, mainly on fruits and salad, and felt amazing!! My energy levels were great, mood was great, and I had a glow to my skin I had never seen before. I was hooked. I knew it was the missing link. Raw Greens!! Green juice, green salad, green foods! From that point on, I have been mostly High Raw, and I have done many Juice cleanses. I love the amazing affects of a daily green juice, which helped me work out a way to clear my skin 100%. I have lifted my depression that I struggled with for years, by combining raw food with moving my body! Movement of the body is so important! Tell us a bit about your business. What are you up to over there? My business is called Juice Rehab. 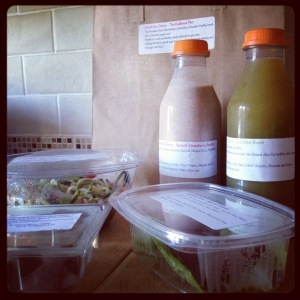 I make and deliver bespoke Juice cleanses to people’s home or work, nationally in the UK. 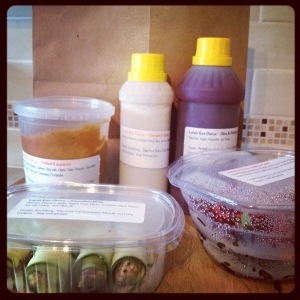 I also deliver raw food lunches called “Lunchbox Detox” to the local area of Milton Keynes in the UK. 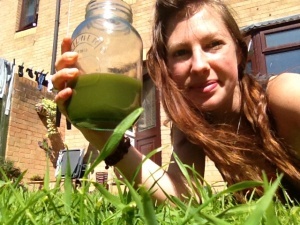 I run workshops and do one-on-one raw food coaching and uncooking lessons. I also work as a health coach helping people to reach their health and life goals. What is your favorite raw food recipe to make? I love Green Juice! My favorite combination is cucumber, apple, lime and mint. So refreshing! It is very rewarding, especially because it’s something I believe in so passionately. It’s great to put my creativity to work. How can people experience your raw food goodness? My website is being worked on as we speak, and will be running very soon! You can contact me there for the Juice Cleanses and Health Coaching. Ooooh…that’s a hard one, I have so many books! I’d have to say, 365 Power Sayings, by Louise Haye. I read one every day. They are a great start to the day! Another hard one, I love all kinds of music, depending on my mood. I do love Ben Howard at the moment! Sharks! Ever since Jaws, I was scared to sit on the toilet seat! I’ve got over that now, but I still get scared when swimming in the sea. Crash. When I saw it at the cinema I was blown away. I found it very powerful! Right now I would have to say watermelon! It’s so hot here, it’s the perfect summer food. Sarah Hook (a.k.a “The Juice Lady”) is a Holistic Health Coach, and owner of Juice Rehab. She is passionate about helping people feel and look their best, and she’s on a mission to get the world to drink Green Juice. She lives in the UK. This is awesome! Well done to “the juice lady” ! I wish more people would see the change they can make in their lives if they only started juicing and cutting bad things like wheat! Heya i’m for the primary time here. I found this board and I in finding It really useful & it helped me out much. I am hoping to offer something back and help others such as you helped me. in your post is simply nice and i could assume you’re an expert on this subject. Fine with your permission let me to grab your RSS feed to keep up to date with forthcoming post. Thanks a million and please keep up the enjoyable work. Lots of helpful writing tips/hints are available online. You can also send a personal email through the “contact us” section of our website and I can let you know about my own writing classes, etc.